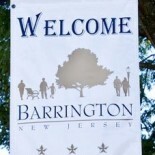 Barrington Borough Council on Wednesday approved the appointment of lifelong borough resident as the new chief of police. 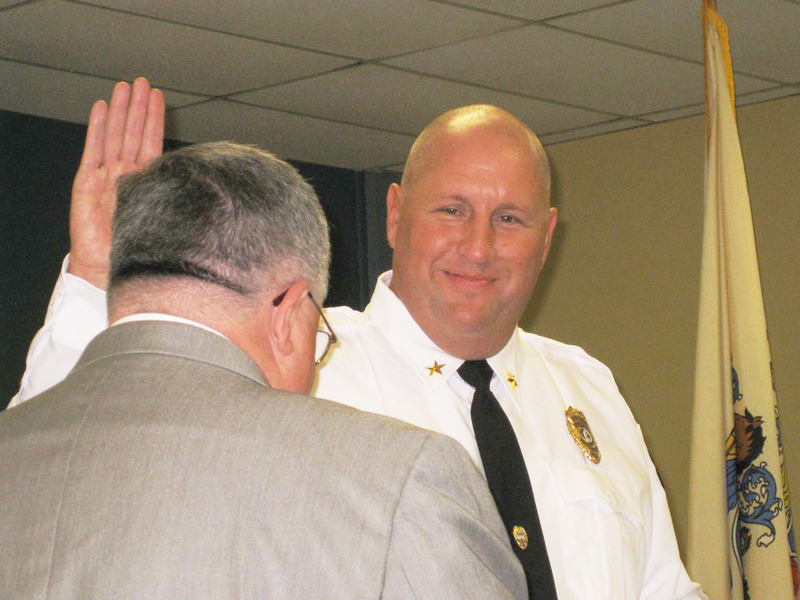 Police Chief Dave Roberts is sworn in by Mayor Robert Klaus Oct. 14, 2013, at Barrington Borough Hall. Roberts was sworn in about 6:10 p.m. by Mayor Robert Klaus before a more-crowded-than-usual meeting space. “We’re looking forward to you taking the reins,” Klaus said during the “Comments from the Governing Body” portion of the meeting after each council member offered their congratulations to Roberts, who joined the department in August 1994. Several residents also stood to offer their congratulations to Roberts. Two residents spoke of the need for greater sharing of information on criminal activity in the borough, an issue that Director of Public Safety Robert DelVecchio and Chief Roberts said is being addressed. In coming weeks, the department will begin a program that more directly shares news of criminal activities with news outlets, including the Barrington Bulletin, both men said. Council members also spoke at length with a resident who wondered why the borough wasn’t doing more to become part of the Colonial Alliance to share police services with other surrounding communities in an effort to save tax dollars in Barrington. Klaus noted the borough is involved in more shared services agreements that any other nearby community, but that the borough is taking a wait-and-see approach regarding the expensive Colonial Alliance study that originally involved Haddon Heights, Haddonfield, Audubon, Oaklyn, Haddon Township, Collingswood and Mount Ephraim. Councilman Shawn Ludwig also noted the benefits of having a chief who knows the town as well as someone like Roberts. “You can’t put a dollar value … on his leadership,” Ludwig said. Also during the council meeting, Council President Kirk Popiolek told residents he would be in Trenton this morning to speak to the state Department of Transportation regarding what’s delaying the permits to begin work related to the White Horse Pike redevelopment project. “I’m not coming home empty-handed,” Popiolek said of the trip. – A proposed $637,500 payment, along with closing costs, for the Duckrey Estate at 300 White Horse Pike. The property, including the former Bok Bok Fresh restaurant, is assessed at $720,800. This land would be used as part of a jughandle next to the Wawa redevelopment zone. – A proposed “consideration in the amount of $27,500″ for portions of 221, 235, 237 and 241 White Horse Pike, property around the former Dante’s bar and restaurant. This property would be used as part of a proposed turning lane from the White Horse Pike to Copley Avenue to allow traffic to more easily enter Interstate 295. — authorize $3,500 for an appraisal of the Barrington Business Center; and more. This entry was posted on August 15, 2013 by Barrington Bulletin in Borough Hall, Business / Money, Crime, Events, Safety and tagged chief, dave roberts, police chief, redevelopment, white horse pike, whp.